At Deupree House, a satisfying lifestyle for discriminating tastes doesn’tjust happen. Thoughtfully designed surroundings and a professional staff encourage residents in a life-enriching environment. 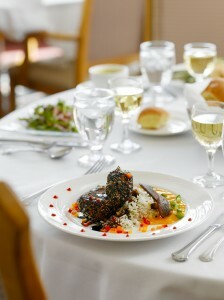 In line with this residents enjoy flexible dining options prepared by our Executive Chef. Maybe you would like to enjoy a glass of wine while you choose from our restaurant style menu. Mealtime is highly anticipated with its combination of great food and fellowship with neighbors. Private dining options are also available along with convenient catering services for private parties or special events.